As a partner in the Government Performance Consortium (GPC) initiative, we are excited to share with you a mini-documentary about the first Love of Cities Tour in Washington State, which has sparked tremendous excitement across our state for new ways to connect cities and citizens in co-creating more vibrant, healthy and resilient communities. Our consortium designed the Love of Cities Tour to be an experiment with the idea that we should talk more about love, emotions, and all the ineffable qualities that make us human in the context of government improvement and civic engagement. Peter Kageyama, who headlined the tour, is a nationally renowned author who writes and speaks about the important role cities play in forging emotional bonds between people and their places. In a series of interactive workshops and conversations, Peter tapped deeply into the love and creative energy of city leaders and employees as well as community leaders and volunteers and challenged them to design fun, practical, and low-cost projects (aka “love notes”) to make their communities more lovable. We learned amazing things on the tour. First and foremost, there is already a lot of love here. All the communities we visited have city employees who care deeply and dedicate themselves to making the city great. All these communities have residents who took upon themselves to create places and experiences that make where they live beautiful, artsy and lovable. Examples include the “yarn bombs” that decorate streets in Sequim, the “I Love Renton” mural in Renton, the Shoot the T photo contest in Tacoma. Last but not least, it’s really important to have fun. People love fun and are their best when they are having fun. Those of us in government want to create fun for people in our communities, and Peter showed us that asking the question “where is the fun” opens up possibilities for a whole different kind of solutions in building a great city. 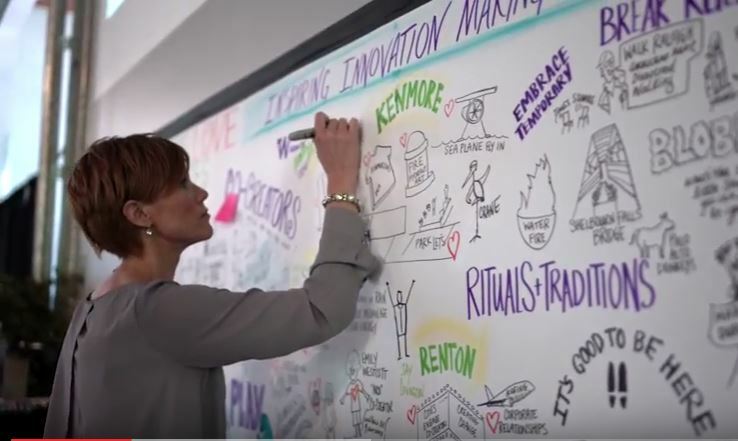 The City of Kenmore is an early adopter of Peter’s ideas and strategies and has already experienced remarkable transformations in their organizational culture and community relationships. In an upcoming video, the GPC will take you to Kenmore and show you how they have successfully attended to building that vital emotional infrastructure that creates a shared sense of purpose and holds the city and community strongly together. Stay tuned! Coming up next – on Thursday December 8 the GPC will be holding a forum titled “Lean and Beyond: Taking Local Government from Good to Great.” You can learn more about and register for the event here.